Inconel 600(UNS N06600) is a typical nickel-chromium-iron superalloy. Due to the high nickel content, it has excellent corrosion resistance to many acids and alkalis, especially, the resistance to stress corrosion in chloride conditions. The chromium(Cr) contained provides resistance to oxidation and erosion in oxidizing acids at elevated temperatures. 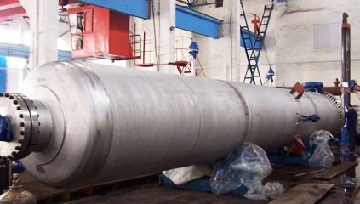 The Inconel 600 is commonly used for the manufacture of chlorination reactors for chemical processing. A chlorination reactor made from Inconel 600 plates, for a client from Poland. The above photo shows a chlorination reactor made from Inconel 600 plates which are manufactured according to ASTM B168 / ASME SB-168. Size: 1400 mm x 16 mm x 11850 mm; design pressure: 1.3 MPa; design temperature: 500°C; working temperature: 425°C; working pressure: 0.74 MPa; fluid medium: chlorine and hydrochloric acid; welding process: AWS A5.11 SMAW; electrode: ENiCrFe-2.